Hello! Are there people who specialize in YNAB to help me set things up correctly in a 1-1 manner? I feel like our finances are complicated and I've tried YNAB a few times and have always gotten overwhelmed because I don't think I'm setting things up correctly and then I give up. Rather that spending a ton of time getting started again and doing it wrong, I'd really like help setting it up properly from the beginning. Thank you! I don't know if anyone offers that service. The Support techs are great. I had a lot of interactions with them. Like more than 20, at least. There's certainly a core of following the 4 steps, but as seen on the discussion board, there are many ways to handle the more complex situations. I just received the book today by Jesse. I've been using the tool for 2 months, but maybe I should have started with the book. The live classes are really good. I skipped a lot of them because I thought the title sounded like it didn't apply to me, but I went back, took them, and did learn from them. I felt the same way, and still do a bit. Like Ben, I have used the support and they've been great. I had signed up for the trial and didn't create the budget until about two weeks later because I was so overwhelmed. The good thing is you can start fresh or create a new budget if you need to. Just thought I would share that I understand how you feel. Rolltide525 oh, that was scary due to my old thinking, but yes after I learned I was doing things wrong, I reset Jan. budget. 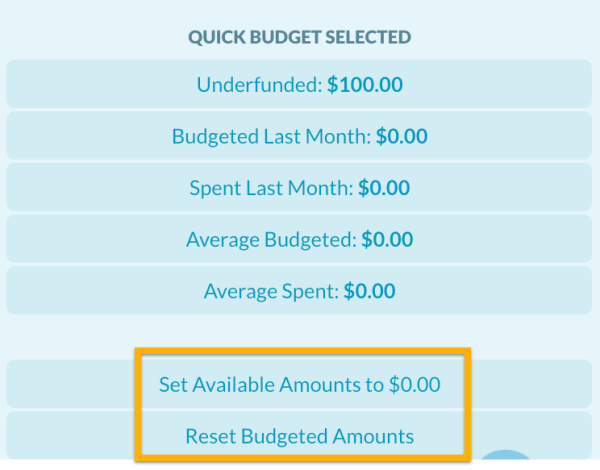 Ben K. How did you reset your budget? Using Freshstart? Eric Poulin No, at the beginning on Feb, I went back to Jan. -after learning I wasn't really following the rules - and I used the reset budget amounts. That unfunded everything I had put money in Jan. (Positive TBB) empty or negative categories at that point). Then I checked my goals and rebudgeted money from tbb into the categories. Ben K. Ok cool! I know that Fresh Start is supposed to be an Amazing Feature of YNAB, but I feel I may never use this.... there is something about losing all the work and the past on something. We call what Ben K. mentioned a "Mini Fresh Start". Click Set Available Amounts to 0.00. Take the classes, and follow the Quick Start Guide slowly but surely. And the YNAB Support Reps are always SO happy to help and can answer just about any question - you can send them screenshots and videos, and they can send you all kinds of resources (including custom videos just for you). The Nick True videos on Youtube are time well invested. Really helped me out a lot. I'd recommend going over that content before diving into the software too much. The book took me two evenings after dinner to read, and the links are more condensed than the book content. Just want to say that I was in such a similar boat, and I understand Coco C . I tried YNAB two times and failed like I failed and couldn't "do it." What I now know looking back was that those two times were part of our journey to getting it. But like you, I wondered the same thing, can ONE person help me set it up so I don't wasted my time doing it wrong?! I did happen to find a person at my work that helped me, but they were mostly cheerleading support 🎉. However, the real help came when I actually watched about 3 of the LIVE Classes, kinda incognito in the background, but then asked a few questions and it was good and a bit helpful. Next, my friend helped me with some of the categories that he used, but I came to find out anything can be changed quite easily, so tweaks can be made all along the way without feeling like you are stuck in something. So much of those things is here on the forum, which I didn't really discover until later. Then about month 2 or 3 I began to pull on the YNAB support team, because red categories didn't make sense in how they acted, etc. I was just confused. There individual help, 1-1 personalized videos customized for my need, REALLY helped. Keep it up, you got this! Louie That's steep.... especially for someone who needs a budget. There's plenty of free help available. As someone who can charge a self-employment consulting rate of more than that for what I do for a living, I think it's a complete rip-off at $100/hr. Somewhere closer to $35/hr would be a bit more reasonable. nolesrule I never said it was a good choice. Just answering the OP's question. Its up to her what she does with the info. How's it going with the budget?